The 1909 Buckingham Murders: Part XV | slate river ramblings . . . . The imputation as contained in the petition that Senator Gayle advocated a bill in the Legislature having any bearing on the case of Dallas Wright, is without any foundation in fact. I know that that bill was offered and fought on purely sentimental grounds. Buckingham was the county in which Judge Hundley stepped upon the threshold of life, and it was merely a matter of sentiment on the part of the people of the county that he should have his old county under his jurisdiction. . . . I will further say that Judge Hundley, in my opinion is the ablest circuit judge in the State, pure and incorruptible, and that Sands Gayle is a thoroughly conscientious attorney. 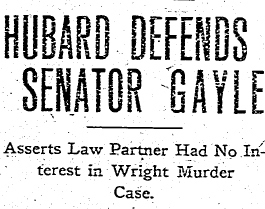 I desire to further state that the assertion that the law firm of Hubard & Gayle, or either of its members, had been employed in the Wright case, is misleading and untrue. The fact is that at the preliminary hearing I was ill, and my partner, through courtesy, appeared for me. Senator Gayle made a speech at the first prosecution through kindness to me and without any fee. He took no part in any of the cases and had no feeling or concern in the matter. Whether or not Senator Gayle directly influenced the “emergency clause” that moved the trials to Judge Hundley’s district remains unknown; however, the attorneys for the defense were careful not to make any direct accusations. The change of district, however, had a swift and negative impact on both the cases of Edward Jones and Dallas Wright, resulting in decisions their attorneys were eager to have reversed in another court. A change of venue and new trials might result in just that. . . .